Nicola & David, set their wedding date and chose Meols Hall, Southport to say their vows. The historic country manor house dates back to the 12th Century and is set in 100 acres of private parkland in the quaint little village of Churchtown. Meols Hall is one of the oldest buildings on the Merseyside Coast. Nicola’s morning getting ready was lovely. With her Mum, Brother and her 2 lovely bridesmaids by her side. She was really calm and very chilled, although Nicola said she felt nervous as the morning went on and had a funny feeling (that’ll be the butterflies). 3 years in planning their wedding and it was suddenly here. David had the help from his Mum and Dad and his 2 best men by his side, trying to keep the nerves at bay. Nicola’s gorgeous veil and Pronovias wedding dress, were from Brides of Liverpool. The beautiful bridesmaids dresses where from Monsoon. Having Sharon Murray from TaDa Hair and Makeup was a treat as Sharon is a former Riverdancer and had just got back from doing hair and makeup on the One Direction Tour. David was suited and booted in his full HM Armed Forces attire and looked amazing, with his best men’s suits from Greenwoods Online, they all looked the part, ready to rock and roll. Their wedding day was put together beautifully and with the help of Paul and Linda from Norwegian Wood Florists, who also do floristry for TV shows and films, they did a fantastic job. Carla at Add a Little Sparkle dressed the Tithe Barn at Meols Hall and catered to every detail that Nicola wanted. Their stunning wedding cake was made by Amanda from HoneyBugs in Walton Vale, which tasted delicious and had a different layer inside, which was different. Nicola said she wanted it to symbolise a good mix of their personalities. 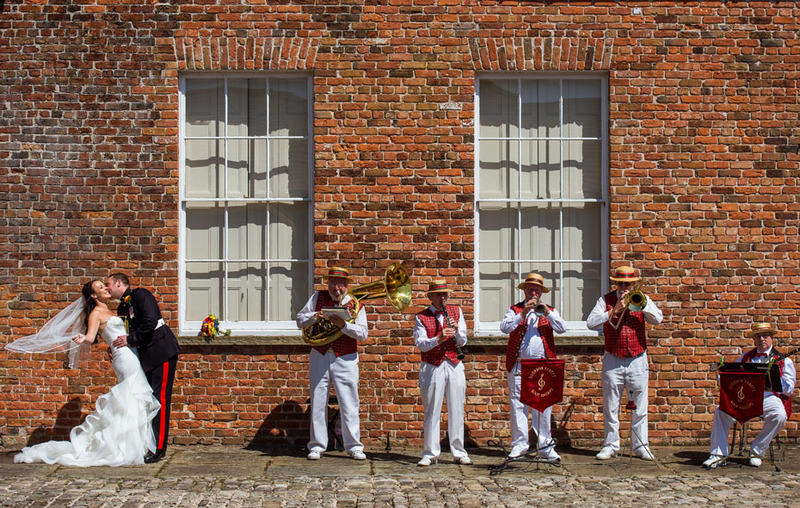 During the day celebrations Nicola and David had the most fantastic Band playing, Bourbon Street Jazz Band. With a little help, we created on of my favourite wedding photographs of the day. With a little help from their friend, Joey Davies, who plays the Bagpipes for HRH Queen Elizabeth. He travelled up from Buckingham Palace that morning to perform at their wedding. Such a special moment for them both and a once in a lifetime experience to have the Queens chosen piper on their wedding day. I asked which were their most memorable moments of their ceremony and Nicola said “WOW I don’t think that I can pick one thing in particular, but actually walking down the aisle towards David was so special and then seeing his face, I will never forget the look in his eyes, when we took our vows it was so special.” Nicola’s mum did a lovely reading and held her nerves together, whilst her brother walked her down the aisle, he’d held it together and the proud brother he is.